Liberty Karate Club was founded in 2003. We teach Matsubayashi Ryu Karate-do. The kanji (characters) for Matsubayashi Ryu can be read as either "Matsubayashi Ryu" or "Shorin Ryu". Though the terms are interchangable, it should be pointed out that there are four major styles of Shorin Ryu, and if you wanted to distinguish our style from the other three, then the designation Matsubayashi Ryu would be the correct one. Matsubayashi Ryu was created by Grandmaster Shoshin Nagamine in 1947. 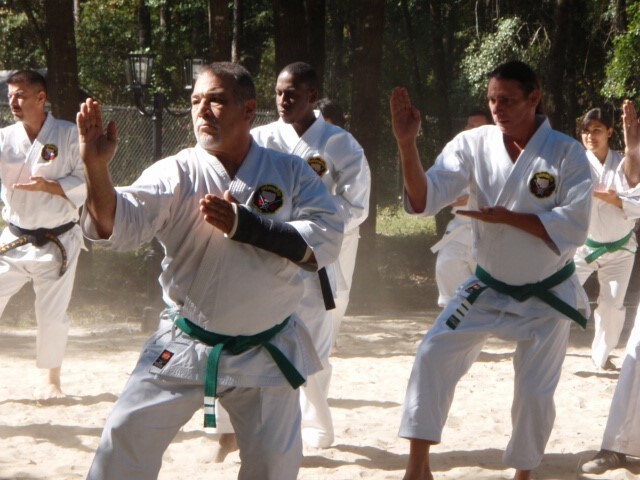 Liberty Karate Club meets at Hope Lutheran Church located at 2600 N Dean Rd in East Orlando. Classes are Mondays and Wednesdays from 7:00pm to 8:30pm. We train men and women from 15 years old and up. Tuition is $40 per month and there are no contracts. We invite you to stop by and visit if you are in the area!